Hey look, kids! 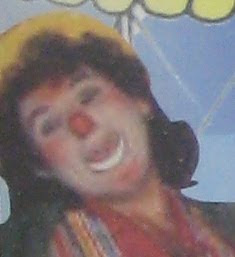 Our ol' friend Disturbo the Clown is back! Yep, I was out walking the dog this morning and I saw this sign on our town square, letting us know that the Ticoliny du Sarousch is back in Commerce, TX. It was here last fall, and apparently their visit is becoming an annual event. 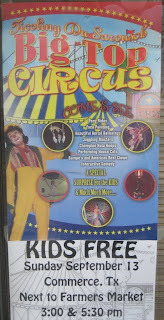 But unlike last year's promotional poster, the image of the acrobat isn't centered on the clown's crotch. And I see that, like last year, they're providing "a special surprise for the kids," which I still find slightly suspect. But Disturbo the Clown wouldn't mean any harm...would he?